This is a fantastic Baluwessi Lead Crystal 3 in 1. It's at the top of the crystal bowl line. 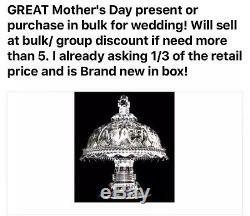 Add the Post office's restrictions on package height so now you get bowl sets with out pedestals that are short and light wheres the lead in the lead crystal? They just do not have the flare of a truly fabulous Baluwessi Pedestal. If you are going to throw a party... If you are going to have a Table top Center Piece. Then go big with Baluwessi. True Lead Crystal Elegance and the Extra Size to match your BIG EVENT. 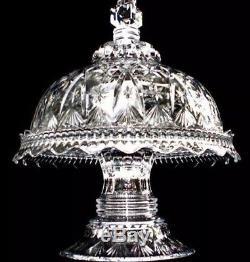 Baluwessi Crystal Bowls will crown your Table. The combination three in one cake stand, Punchbowl and chip and dip server is a versatile two piece crystal glass set that can easily be configured into three different uses. 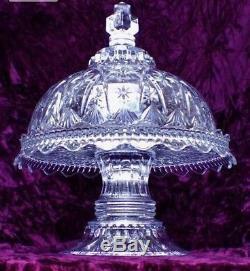 In one configuration it can be used as a pedestal cake stand with cover. In another configuration it becomes a Punchbowl. Use the base only and it becomes a chip and dip tray. Perfect for formal home entertainment, your combination set will act as the centerpiece of a beautiful display. You can be confident that it will add elegance to a special affair. Your guest will be impressed by the fine European craftsmanship. Made from 24% lead crystal in a two-piece configuration top and bottom. The cake stand platter is 12 inches wide and fits a standard 8 inch cake with the cover on. The Punchbowl holds 1 gallon beverage. 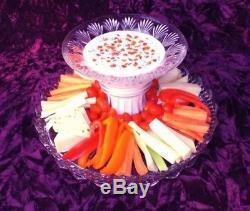 The punch bowl and chip and dip server have serving tray at the base. The photos show two complete cake stands so as to show the various 3 in 1 combinations. Only one unit is for sale for the price. Send me a message if you have any questions. This item is great as a wedding present , Mothers Day gift or even a house warming gift as well. Item is very heavy and you will not be disappointed. 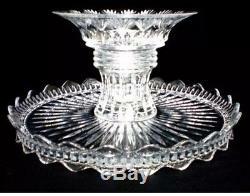 The item "Baluwessi Lead Crystal Pedestal 3 In 1 Cake Plate Stand Dip Platter Punch Bowl" is in sale since Tuesday, April 26, 2016. This item is in the category "Pottery & Glass\Glass\Glassware\Contemporary Glass\Crystal". The seller is "sanctuary1999" and is located in Navarre, Florida.